Mabel Remington Colhoun (1905-1992) was a pioneering woman, who had limitless energy and functioned in many roles in her lifetime. She was a teacher, a co-founder of the Nursery Schools in Derry, artist, traveller and archaeologist among other things. Her life’s work is unknown to the majority of the population of Inishowen. 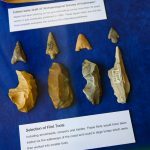 It is in the realm of archaeology that she has left Inishowen a treasure of information about its past. 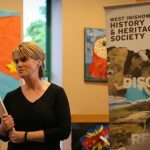 Along with her recordings of archaeological sites in Inishowen, she recorded heritage and folklore from the people who she would have met on her numerous excursions in the peninsula. This exhibition is an endeavour to acquaint the people of Inishowen with someone who loved the peninsula (her family originates from Malin) and who understood the importance of recording archaeological sites and folklore before they were lost to the depredations of time. She was the first person to systematically catalogue known and previously unknown archaeological sites in the peninsula of Inishowen. While doing this, she would record snippets of related folklore from locals. Her work is of the utmost importance in this field of study and it continues to be an essential reference and guide to anyone who wants to explore the archaeology of Inishowen. 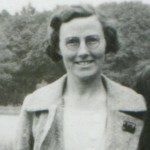 Her book “The Heritage of Inishowen: Its Archaeology, History and Folklore” was published, posthumously, in 1995. At present, it is rare and is unavailable to buy. 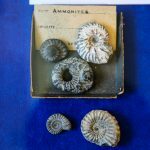 Consequently, it has increased in value significantly, over a short space of time and copies are keenly sought after by enthusiasts. 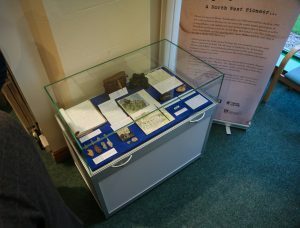 This exhibition is being displayed by the Buncrana Library, St. Mary’s Road, Buncrana. This a joint venture involving the Donegal Library Services, the Tower Museum, Derry and the West Inishowen History & Heritage Society. Over the last few months the WIH&HS has been cataloguing Mabel Colhoun’s archives and artefacts in collaboration with the Tower Museum. The purpose of this is to create a database of Mabel’s life and experiences which will be made available to the general public. The main exhibition of Mabel’s work is being displayed concurrently in the Tower Museum. Having an exhibition in Buncrana is like Mabel coming home to her roots. 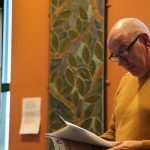 The Buncrana presentation is a satellite of the main exhibition in Derry and there are plans to display this presentation in Carndonagh Library after it leaves Buncrana. Sinead Mc Laughlin (Senior Librarian), Buncrana Library. 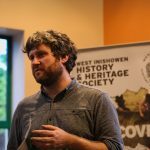 Ronan Mc Connell (Education Officer), Tower Museum, Derry. John Mc Carron (Artist), WIH&HS. 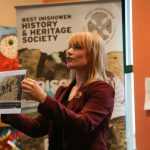 Denise Henry (MA Museum Studies) Visit Inishowen.